Llanelli mayor David Darkin has sent images to the art dealer who bought Banksy's design Season's Greetings, painted on a garage in Port Talbot. "It's better to have it protected in case it is a Banksy," said the mayor. He based his opinion on the photographs he had seen, and the claim that the graffiti was said to be at least a decade old, which is when "Banksy rats" appeared in industrial towns. "I'm happy to go with 50-50 for now that it's a Banksy," Mr Brandler said. "I studied in Bristol and lived in London and I've been exposed to a lot of Banksy including his rats on Westminster Bridge," she said. "So I knew right away when I saw the Llanelli rat. I didn't tell anybody because I wanted to be able to come back and see it." 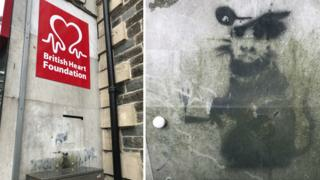 Mr Darkin said: "The hope is that if it is a Banksy it will bring much needed visitors to Llanelli and the town centre." Councillor John Jenkins, who represents Llanelli Centre, said: "Fingers crossed it is a Banksy, but worst-case scenario it isn't and is still a talking point and people still come and see him." Video Graffiti: Is it culture or vandalism?